Senior Benefit Services, Inc. Home Health Care FAQ - Senior Benefit Services, Inc.
You may have noticed we’ve been doing a lot of talking about Home Health Care lately! 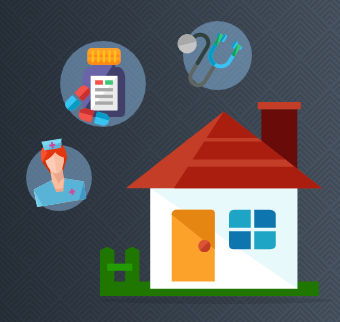 A lot of agents have reached out to us with some questions and we thought it might be helpful to put together a list of some of the most frequently asked questions about home health care. Q: How many days does my client need to spend in the hospital before they can get the benefits from the Home Health Care Plan? Q: How difficult will it be for my client to qualify medically for this plan? A: Not difficult at all. There are only 2-3 underwriting questions, and there are no medical exams required! And by 2-3 questions we don’t mean questions 1A, 1B, 1C like you’ll see on some other apps. The app only has 2 or 3 simple yes or no health questions. Q: Does the client need to be receiving Home Health Care in order to take advantage of the built in Rx benefit? A: No. As long as the prescriptions are filled after the policy is in effect, your client can start taking advantage of this awesome benefit as they continue to buy and pick up their prescriptions just like they always have. Even better, the Rx benefit is not subject to the policy’s Pre-Existing Condition Limitations. Q: Who are agents selling this to? A: Everyone! It’s a perfect add on for any of your clients. The benefits are all paid directly to your client so even if their current plan covers a home health care service, they’ll still receive the Home Health Care benefits. If you know your clients are taking medications or if they’ve expressed concern over how they can afford to recover at home, this plan is perfect for them. Q: What’s the best way to bring this up to my clients? A: A lot of our agents are having great success handing over a copy of the 1 page infographic (email us to request a copy for your state) during what would normally be a down time in their appointment (like when you’re double checking or signing an application). Then discuss with your client the immediate Rx benefit and the additional coverage they’ll receive to have the ability to recover at home. Q: I see there are 3 plan options. What’s the most popular? A: The most popular plan option is Option B. It’s a great mix of competitive premiums and great plan benefits. Plus it has the same $600 maximum Rx Benefit that Option C has, but at a lower premium. Q: What are the real selling points for this plan? A: Above all the Rx Benefit – for many clients the maximum Rx benefit is higher than their annual premiums! If you know the medications your clients are taking you can easily calculate their benefits. Even if they don’t totally exhaust the Rx Benefit, they’ll only be paying a few dollars a month to have access to Home Health Care benefits. If your client is on the fence about ever needing the plan, show them the Return of Premium Rider. This will returned 100% of their premiums paid (minus claims) if they pass away before they turn 86. Have a question we didn’t answer? Feel free to ask us in the comment section below or contact the Marketing Department either by email at Marketing@Srbenefit.com or by calling our office at 1-800-924-4727 and asking for Marketing. Plan benefits and availability vary by state. Contact the Marketing Department for state specific information. I emailed you over the state specific info. Let me know if you run into any questions. I’d like more information and see the infographic. I reached out to you via email. Feel free to email me back or give our office a call at 1-800-924-4727 and ask for Eran.